So-called “health care reform” isn’t usually a topic for a cigar publication to tackle. But the more research one does on the proposal now being debated in the U.S. Senate, the more it becomes clear that it’s grossly unfair to smokers. The leading proposal from Congress contains many changes to current law, but three aspects of the bill in combination create a system that will increase costs for smokers while subsidizing others that are guaranteed to cost more. This despite the fact that through the punitive SCHIP tax, smokers already pay more than their fair share of health care costs. The bill would require every individual to buy insurance and simultaneously prohibit insurance companies from refusing to cover individuals. It also mandates that insurance companies can only use three characteristics (and only those characteristics) for charging higher premiums: tobacco use, age, and family composition. For tobacco users, Congress empowers insurance companies to charge 50% more for insurance. Because smoking is one of a few areas where insurance companies are allowed to charge more, and since every individual must buy insurance, insurance companies will be encouraged to charge even lower-risk tobacco users like cigar smokers the full 50% increase. Meanwhile, Congress would prohibit insurers from charging more for pre-existing conditions, who are unsurprisingly the most expensive people to insure. This means that those with illnesses like cancer, lung disease, throat cancer, or anything else—including those that may have been caused by smoking—cannot be charged more while smokers can be. The irony (and absurdity) should be obvious: If you’re already sick from something caused by smoking, you pay less than smokers who likely only have a slight chance of getting the very same disease. There are, of course, many other reasons for opposing a federal health care overhaul that smokers may or may not agree with. However, all smokers, particularly cigar smokers who will be forced to buy pricier insurance unwarranted by their relative risk ratios, should oppose (once again) being unfairly singled out by the government and forced to subsidize the health care of costs of non-smokers. For years, cigar and pipe smokers have tried to distance themselves from the lowly cigarette smoker. You rarely if ever stuck up for us when it came to bans and taxes because you were ‘connoisseurs’ of the leaf and cigarette smokers were just addicts. Even in this article you try to differentiate between tobacco users. Well, welcome to the party. For those finally getting the picture…welcome to reality! The health care “reform” bills that the current administration and Congress are trying to force on us are not so much about providing good, quality, affordable health insurance to every American as they are about allowing access to control of every possible detail of every American’s life. If you think about it, just about every decision you make (what you drive, what you eat, where you live) has health care consequences. If the government is allowed to control health care, it opens up the doors to controlling everything. And once that Genie’s out of the bottle, good luck stuffing it back in…our country will be forever changed. I hate to be pessimistic about it, but…”Smoke ’em if you got ’em” will become “Smoke ’em while you can” if a healthcare bill passes with the current crop of clowns in charge. Occasional cigar smoking should not be lumped into the same category as cigarette smoking, and the reasons are obvious and backed up by statistics. It’s got nothing to do with style of being a “connoisseurs”. The fact is that occasional cigar smokes are at a tiny fraction of the risk that even light cigarette smokers are. The problem the government has is: how do you differentiate between an occasional cigar smoker and a heavy cigar smoker? How do you know if they inhale the smoke or not? You can’t. The government do the best they can. The US is one of (the?) richest nation in the world, with the worst health-care. I think you’re claim that the underlying motive is to “control every aspect of American citizens” is a bit ridiculous. That was a good reply and I enjoyed reading it. The only point I will make is that Fascism and Nazism are extreme-right ideologies, not extreme left as you have wrongly labeled them. Other than that, interesting read. If you can demonstrate how Fascism and Nazism are extreme-right I might reconsider how I labeled them, but the fact is they share more in common with Stalinism and Marxism than with anything remotely close to libertarian, small government philosophies. Brutal dictatorships with command-economies and limited personal freedoms are all the same at heart whether the brutality is fairly indiscriminate (Stalin) or racially motivated (Hitler). But, hey, this is a cigar blog…what are your favorite smokes? I am partial to LFD Ligero Cabinet and DL lines, CAO LX2, and Oliva V when looking for a full-bodied experience; CAO Gold Vintage, Oliva or Camacho Connecticuts when looking for a milder, more nuanced smoke. Wiki "Fascism" and then "Nazism". In any case, I think they want us to talk about cigars and the politics of smoking. Not debate about whether Fascism is right or left wing. Besides, if you really think it is left-wing, then there won't be anything I, or anyone else, could do or say to convince you otherwise. It's almost like saying black is white. Anyway, each to their own. Merry Christmas to you and yours. Those changes generally apply only to the private insurance market — not employer-based group insurance. And believe it or not, even the cancer society opposes that regulation, because “family characteristics” opens the door to all sorts of rate hikes and makes it difficult for many to get coverage. I doubt it makes it to a final bill, presuming there will be one. Ridiculous? Not after examining the extreme leftist/Marxist bent of the current administration. And, yes, the US is the richest nation in the world, but, no, we don’t have the “worst” health-care system. We have a health-care system that rich Canadians flock to when their government-run system makes them wait. We have the health-care system that has been at the heart of more medical advances in technology, patient care, and pharmaceuticals than any other country. Declaring that we are the richest nation in the world would also not be an argument for the government taking control of health-care even if we did have the “worst.” Flat-out the Constitution does not allow for it in any way, shape, or form. The declaration that the government can do the job better is simply socialist pap that hasn’t held up under scrutiny when you actually examine the areas in which the government has taken control of things: Social Security, Medicare, Medicaid for example. The free market is the best place for advancement of technology and care and for ensuring the personal freedoms of the citizens of this country. I would not argue that there is nothing wrong with health care in this country, but the majority of the problems that are there have been caused or exacerbated by government intervention at many levels. Further government intrusion is not the cure. All I will say is if you think the Obama administration is “extreme left” you’re got your wires crossed. Communist Russia is “extreme left”. Fidel Castro is “extreme left”. On the grand scale of global politics, Obama would be in the middle at best. Even slightly right. Given, in the US he is considered left-wing, but “extreme left” is really an overstatement. Compared to must other 1st world country governments, Obama could even be considered slightly right. Imagine, if you will a straight line. On the right end of that line is anarchy, the complete absence of government. Just to the left of that is limited government, also known as libertarianism or the U.S. Constitutional form of government. Republican conservatism is just to the left of that, followed by what you might consider “moderate” politics. To the left of center is the traditional Democrat liberalism of someone like a Daniel Patrick Moynihan or JFK, more left of that is “soft socialism” such as found in the UK or many other European countries. And to the left of that is a broad category called “Totalitarianism.” This last category includes Marxism, communism, Stalinism, Maoism, Fascism, Naziism, and a host of other variations on the theme. What theme? Complete government control. It is true that the Obama administration does not currently reside in that most extreme left category as a whole. It is also true that many appointees of The One are faithful adherents of Chairman Mao or Saul Alinsky (“Rules for Radicals” anyone?). The simple fact is that Obama is, at best, a “soft socialist” and nowhere near the political middle. If you grade on a scale, like you seem to be doing, then the leftist loonies in Cuba, N. Korea, Venezuela, and other countries definitely make Obama seem more moderate, but if you judge based on an immutable and unchanging set of standards then he cannot be considered anything other than far left of center. Why should the “grand scale of global politics” affect where we consider our leader to be on the left/right scale? “He’s a lefty, but he’s not as leftist as some of the other lefties out there, so he must be alright.” That’s like saying Hitler was “right-wing.” Yes, he was right-wing compared with Stalin, who applied the “right wing” label to him; but he was far-left on a real-world scale. Cigar smokers are naive if they believe they have some kind of special protection from antismoking laws. That fact is many people inhale cigar smoke, especially current and former cigarette smokers. That said, there is no reason to exempt cigars from regulations applied to cigarettes. In fact, inhaling cigar smoke is much more hazardous than inhaling cigarette smoke, and once the powers-that-be realize that many people who claimed they quit smoking have merely switched to cigars and are now inhaling cigar smoke, you can expect a crackdown. A lot of people find the odor of cigar smoke to be even more offensive than the odor of cigarette smoke, and "smell control" is a driving factor in all this legislation, despite all the banter about public health. It's just easier to go after cigarettes first and then expand the regulations to include cigars. While I agree that many people inhale cigar smoke – especially cigarette smokers – the fact is that it is not _intended_ to be inhaled; and that's how the product should be judged. There are many products available to the general public that could be a hazard to health if used improperly. 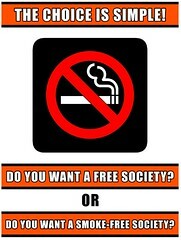 It's not fair to cigar smokers to assume they are inhaling the smoke, because it is not intended to be inhaled. It would be the same to assume all alcohol drinkers abuse alcohol. Some do, yes, but that's not the way those things are intended to be used, it's not fair to throw that blanket over everyone. I smoke about one cigar per week (and a few more around festive time such as Christmas). I never inhale it and I'm very cautious not to smoke in places where it may annoy other people. I believe that most (but obviously not _all_) cigar smokers have similar cigar-smoking habits. That shouldn't be lumped into the same category as regular cigarette smokers, who inhale twenty+ into their lungs on a daily basis and seem totally oblivious to everyone else on the street. P.S. In regards to your last paragraph, when I do smoke in public (at a party or whatever), and I ask people in the vicinity if they mind, I am often surprised by the amount of comments from non-smokers saying they prefer the smell of cigars to cigarettes, if not actually enjoy the smell of cigars. I accept that is not everyone, but unless people are just being nice to my face (a possibility, I concede) then it seems like the substantial majority. In short, I don't think your last paragraph holds much weight.